LAS VEGAS, April 3, 2019 /PRNewswire/ -- SuiteWorld 2019 -- Oracle NetSuite is launching a new business research and benchmarking service that changes the way the technology industry shares insights and knowledge. Unlike expensive services provided by research firms or traditional vendor models that are built on proprietary data, NetSuite Brainyard is a free resource that gives everyone across the technology ecosystem equal access to the research, data and practical advice needed to grow and run a business. Brainyard is available today at NetSuite.com/Brainyard. 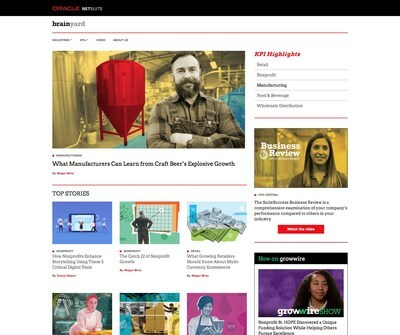 "We're giving away the source code for business growth by providing our customers with unparalleled insights into every single critical business process," said Jason Maynard, SVP of Global Field Operations, Oracle NetSuite. "Companies tell us they want to benchmark their businesses, and we're going to help them do that with Brainyard. Research firms and other vendors charge for this kind of resource, but we consider it part of our commitment to customer success. We're not just delivering bits with NetSuite: It's not just about software; it's about helping businesses grow." Business Research: Includes state-of-the-industry reports and other qualitative and quantitative survey-based research conducted across seven industries by 20 industry principles and nearly 500 subject matter experts globally from across the NetSuite team. Over the past 20 years, NetSuite has worked with some of the fastest growing companies in the world that rely on NetSuite to help them successfully grow, scale and adapt to change.